One of the sweetest holiday traditions involves being a Secret Santa. These three “Secret Santa” stories are heartwarming and celebrate the spirit of giving to others. Easter Seals Rehabilitation Center, located in Evansville, Indiana, serves 6,000 adults and children in need of physical and medical rehabilitation in a 30-county stretch of Indiana, Illinois, and Kentucky. 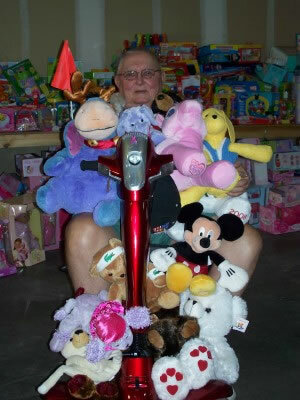 Each year, a call comes in to the Rehabilitation Center from an anonymous man known only as “Pete.” He tells them where he has hidden a large cash donation for them to apply toward the children with disabilities who could not otherwise have Christmas presents. Pete is as creative as he is generous. 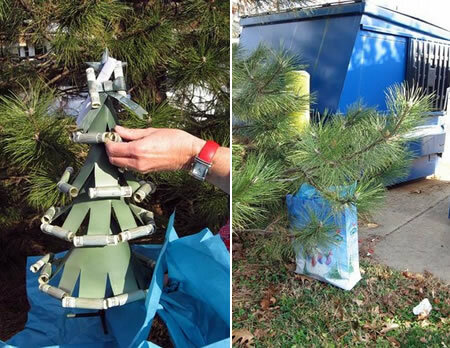 He hides his Secret Santa gifts in evergreen trees, a trash container, a stairwell and other locations. This year, Secret Santa Pete left a gift bag near two blue trash dumpsters adjacent to the Rehabilitation Center´s main parking lot. Inside the bag was a green metal Christmas tree with 30 rolled $100 bills inserted in its branches.This $3,000 donation is the 29th cash gift the Easter Seals Rehabilitation Center has received from “Pete” the mysterious Secret Santa. As per Pete’s instructions, Easter Seals will use the money to buy gifts for at least 70 special needs children whose families cannot afford to buy presents. 10-year-old Riley Christensen was on the family computer with her mother, Lynn, to check out models and prices of bikes to give her dad for his birthday. While surfing, they saw a shop called Bike Rack that was in their town of St. Charles, Illinois, and followed a video link for Project Mobility. It showed Bike Rack co-owner Hal Honeyman building specially engineered bicycles for people with disabilities. Riley told her mom that she was going to buy a specialty bike for a child. So she sent out letters to 75 family members, asking for donations, but the cost of one special bike could be at least $4,000. Her mother was afraid Riley could not raise that much. However, word got around and the 10-year-old girl raised $12,000, enough to pay for seven specialty bikes. On Christmas Eve, Riley wore a Santa hat and delivered three of those bikes: Ava, a 13-year-old girl with spina bifida; Jenny, a 15-year-old girl with cerebral palsy; and Rose, a 4-year-old girl with a rare genetic disorder. “This is the best Christmas I ever had,” said Riley. Tessa is a mom, freelance writer and reporter. She has a special understanding of the challenges facing persons with disabilities. It's her desire to help "disabled" people be participants that could do anything, instead of being spectators from the sidelines. Tessa, I like when you write stories of this type. I hope you write more like this. I enjoyed your piece on Assistive Technology as well. More pieces need to be written about the capabilities of people with disabilities compared to their “vulnerabilities”.